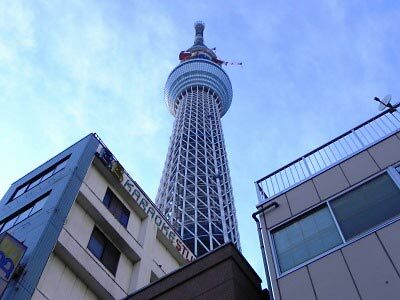 In the aftermath of the earthquake and tsunami, Sky Tree reached its planned height of 634m. However, the pleasant news was not much broadcast in face of the disastrous situation of the damaged area and the difficulty in combatting the nuclear accidents. I personally came to know the fact months later. Tokyo Sky Tree is a broadcasting tower now under construction in the east of Tokyo. Tokyo Tower has been working as the transmitting antenna for TV, FM radio and other telecommunications services since its completion in 1958. However, as the number of high rise buildings increased in great deal in the 1990s, the necessity came to be perceived to build a new tower double as high as Tokyo Tower - 333m - so as to overcome disturbances to TV program transmission. Incidentally the introduction of digital TV transmission was decided and Tokyo Sky Tree was to serve from the outset for digital TV. 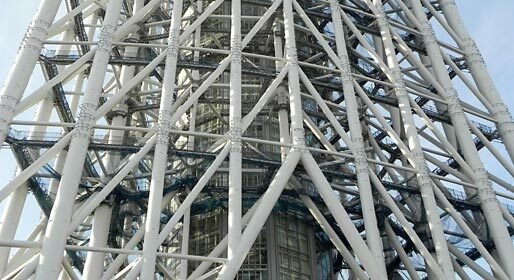 It is advisable to check the official site of Tokyo Sky Tree, if you want to see the technical details of the tower. Grave of Tsuruya Nanboku faces a busy main street. Sky Tree seen from behind a karaoke lounge. No tourist comes by this souvenir shop in Tower View Street. When Tokyo Tower was planned, the investors decided on the height of 333m, because they wanted the new tower higher than Eiffel Tower, then the highest in the world. Tokyo Tower became slightly higher than Eiffel Tower, but incurred cynical observation at the same time that its design resembled to that of Eiffel Tower, though the latter looked more elegant. It was the time when Japan was still criticized for imitating the products and designs of developed countries. “Made in Japan” was then not a proof for good quality, but still identical with cheap and bad quality products. I hope that things have changed in half a century. Though investors intended to have the world highest construction once again, they failed to achieve this goal due to a more than 800m high building in Dubai. However, I hope, at least, that the design and construction of Tokyo Sky Tree are original and absolutely reliable. 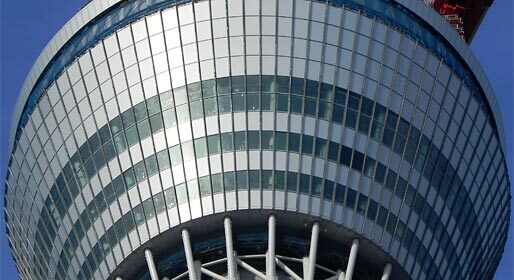 I was surprised to know that a great many people were interested in the new tower and when the construction started in summer 2008 many spectators rushed to the construction site and started to record the growing of the tower with digital cameras. The recent announcement of the date of official opening and the admission fees for the observatories caught much attention of the media. The official opening of Tokyo Sky Tree will be 22nd May 2012 and the fee for the lower observatory at 350m is 2,000 yen and the additional fee for the upper observatory at 450m is 1,000 yen. So, we have to pay 3,000 yen (about US 35$) in total to go up to the highest admissible point of the tower. There are discussions whether these amounts are expensive. Tokyo Tower, for example, asks you 820 yen for the lower observatory at 150m and additional 600 yen for the upper observatory at 250 m; in total 1420 yen. Anyhow, I do not want to go up to the observatories. I indeed went up to the lower observatory of Tokyo tower just after its completion in 1958 and again in 1973. However, I am not interested in climbing up to high places, as I am a sort of acrophobia. It is out of the question for me to pay 3,000 yen only to have torturing experiences. It is much better to see the tower from a distance, than to view distant landscapes from its observatory. Such a construction is dangerous not only when we are inside. When I approached Sky Tree in order to take the photos I put up to this page, I felt awful pressure from the massive construction and happened to come across the idea, what might happen, should the tower fall down? It is indeed much better to see it from a distance. Tower View Street seen from the open air stairs of Sumida Triphony Hall. 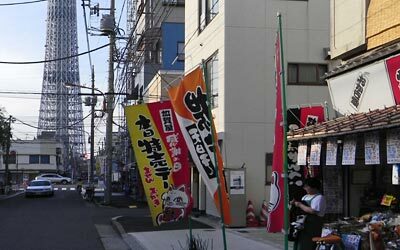 One of the convenient places to see the Tower is a side street extending northwards from Sumida Triphony Hall. I do not believe that the street had a special name before. A poster in JR Kinshicho station shows a scenic street leading to Tokyo Sky Tree. "25 minutes on foot through "Tower View Street" to Sky Tree". 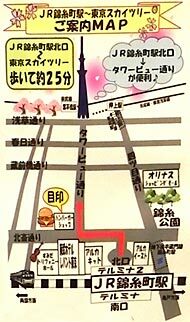 But, now it is called “Tower View Street” and the people in the neighborhood try to profit from Sky Tree tourism. The area, where Tokyo Sky Tree is being built, stretches between Narihira and Oshiage. The area was originally an agricultural land east of Asakusa, but gradually developed as a part of the capital till the end of the Edo period. 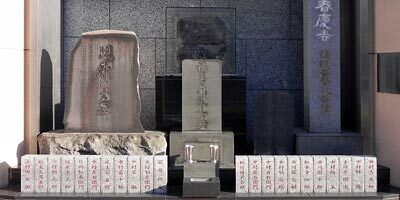 A famous kabuki scenario writer Tsuruya Nanboku (1755-1829) was buried in a temple cemetery near Sky Tree. Since the beginning of the 20th century, railway influenced the development of the area. First a terminal station was built and profited the area as a gate to Asakusa. Then, when the railway was extended to Asakusa, the area fell into stagnation. Now Keisei line and Tokyo metro Hanzomon-line have also stations in this area, but they have not led to the upturn of the economy of the Narihira-Oshiage area. 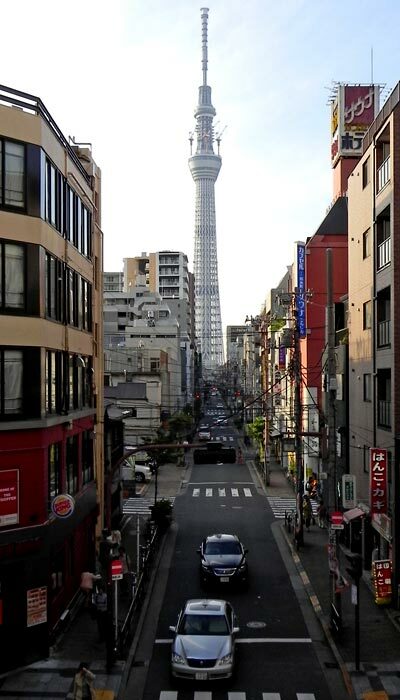 Therefore, inhabitants wish the construction of Sky Tree will give an impetus to the development of the area. A newly opened souvenir shop in Tower View Street did not appear very busy yet. However, we would see what happens when Sky Tree officially opens next spring. I wish that all electricity and telephone wires hanging above the Tower View Street will removed by then, so that we can indeed enjoy an excellent view of the Tower from the street!